Bonjour chers lecteurs (dear readers). Just a quick hello from Provence to ask for more patience. I usually think blog readers don’t need to know anything about the mechanics of blogging. But I have to tell you that uploading photos and preparing a post for publishing can be fiddly and time consuming. And writing requires a clear uninterrupted stretch of time. At the moment I’m a solo parent, so I don’t have very much time, let alone uninterrupted time*. You may have caught my rant over at the Huffington Post about how Darling Man’s visa application was rejected by the French Embassy in Ho Chi Minh City. So here I am, alone in Provence with an active and inquiring two-year-old, both of us shaking off a bit of jetlag and a head cold each. It is beautiful here and the people are lovely. I have so many interesting things to share with you … but later. Right now I have to see as much of France as I can, while doing all everyday toddler-care things that mothers do, like washing urine-soaked sheets, cooking three different types of dinner because someone won’t eat, spending hours patting a toddler’s back and microwaving bottles of milk at 4am. When I tearfully kissed Darling Man goodbye in Bangkok, I thought I’d see him in a week or so. But now he can’t come to Europe and I miss him too much to continue on alone on the two-and-a-half month European adventure we had planned. So I will head home soon, keeping an eye on what’s happening in Egypt in the lead-up to the election on May 23. If there’s any sign of violence, we won’t stop over on the way back home to Asia. Of course, it’s hard to expect sympathy when I am doing my solo parenting in a fabulous villa in Provence. There are a million worse things that could happen to a person. But my blog posts are going to slow down over the next few weeks, and a few guest posts will appear. I hope it’s not too disconcerting. 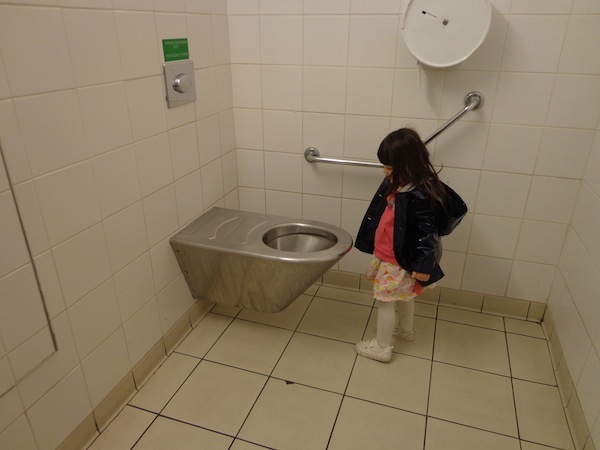 The blog will hot up again once I find some way to get help with Miss M.
In the meantime, here’s a quick look at what it’s like to be a solo parent traveling with a toddler…. 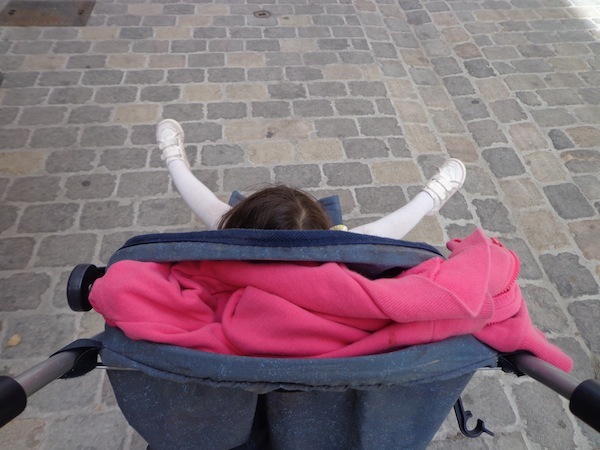 … and on most of our excursions, this is the main view: the back of the (borrowed) stroller and the baby’s head. *Just a note on interruptions. I started writing this very short post with a glass of wine by my side and plans for a hot bath then bed. I’m finishing up the post nearly two hours later, reeking of vomit, as I wait for the washing machine to finish. 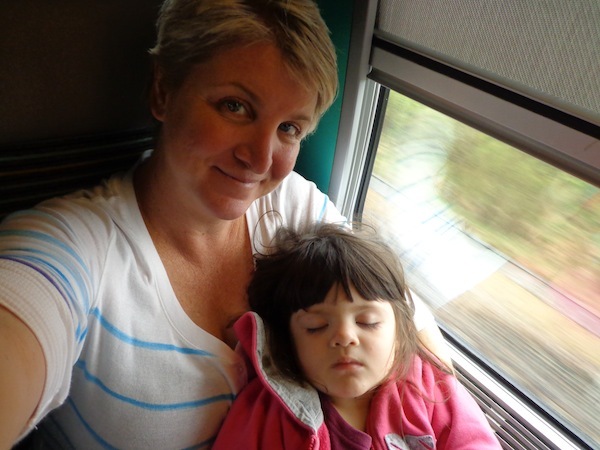 Nice to know this unglamorous side of motherhood happens all around the world, even in glamorous places like Provence. Oh no, so he can’t come at all? That’s just terrible. Hope you both feel better soon. And I do hope you at least are able to eat copious amounts of great cheese before you leave. Thanks Jill. I have eaten enough cheese to last me for a while. We are heading home soon. We have seen some amazing sights and Miss M has enjoyed a range of fabulous playgrounds. But she is asking to go home, so we will go home. drat on being sick, and DM not being there. i bet he misses you both terribly, too! Yeah, he sounds pretty down when we catch him on Skype. We are planning a short holiday somewhere in Asia when Miss M and I get back from Europe. Sorry to hear his visa was rejected. There is nothing wrong with ending the trip early if you’d rather be spending time with him. I imagine it will feel like you’ve been gone twice as long with all of the mommy duties. Miss M and I are having a lovely time, but traveling with a toddler is very lonely, Stephanie. We are heading home soon. Miss M keeps asking “go home to Daddy?” It’s breaking my heart. I’ve used a bit stronger language to describe the situation than you, Denise!